With the clock ticking to get our non-farm payroll (NFP) forecast published before tomorrow’s jobs report, I’m forced to keep the commentary brief. While perhaps fortunate for readers, it’s a bit frustrating given the crazy level of fear, uncertainty, and doubt surrounding the economy (not to mention the unprecedented levels of insanity swirling around the world these days). Between the shut-down, Brexit, slowing global growth, the trade wars, the unfathomable chaos in Washington, and of course the polar vortex (we’re writing from Minneapolis, so that had to be added to the list), the year has certainly gotten off to a frenetic (and frozen) start. And given the times, how could anyone possibly expect anything different? And when you put it all together, there is little doubt that the headwinds buffeting the economy are gathering force, a fact that was made clear with the Fed’s decision yesterday to hold rates steady. As The Fed Chair stated, these “Cross-currents will be with us for a while.” And as a result, Powell reiterated the Fed’s firmly and clearly communicate stance that they will remain data-dependent in their decision-making. Powell went on to say that what the Fed is looking for is data that starts to tell a consistent narrative. As he stated, “Sustained change in financial conditions become important because they have macro-economic implications.” We couldn’t agree more and would point, not surprisingly, to the narrative we’ve been articulating for much of 2018 – labor demand is tapering. 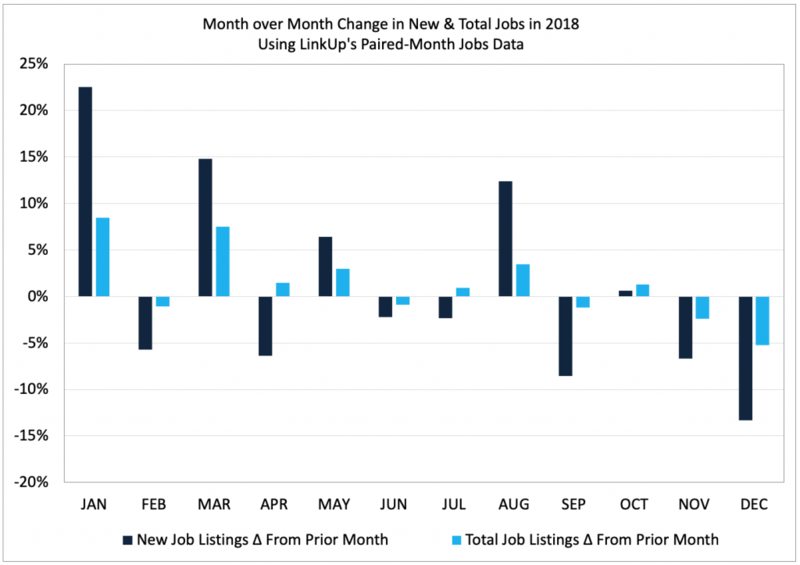 While we don’t have our paired-month analysis yet (it gets produced at midnight following the end of the month and therefore is not available until tomorrow morning), we would point to the steady decline in new and total job listings month to month in 2018 as indicated in the chart below. We’ll update that chart tomorrow, but we expect to see the trend-lines continue. 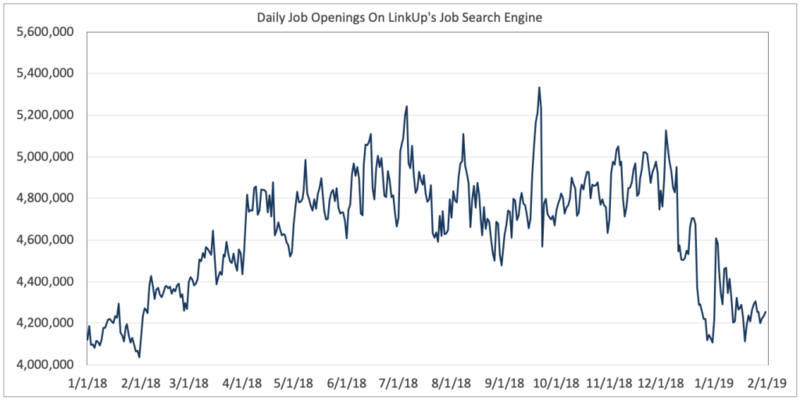 The LinkUp 10,000 Daily, which measures the total number of job openings for the largest 10,000 employers on a given day, tells a similar story. And while seasonality definitely factors into the chart below, there is no doubt that labor demand in the U.S. is waning. The LinkUp 10,000 Daily has dropped 7% since its recent peak of 2.55 million jobs in October. 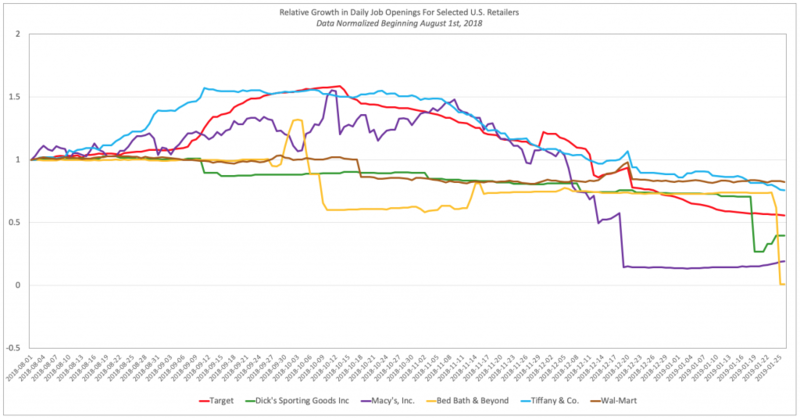 Job listings in our search engine, including sponsored jobs (where employers are running active ad campaigns on their job opening with pay-per-click advertising budgets), and organic jobs have dropped 17% from their most recent peak of 5.1 million on December 4th. Equally as troubling, Job Duration is rising steeply, jumping from 41 days in October to 53 days in January. Job Duration measures the average number of days that job listings were on an employer’s website before they were removed, presumably because they were filled with a new hire. In this regard, Job Duration is a very close proxy for ‘Time-To-Fill, a key measure for hiring managers at an individual company level and effectively a measure of hiring velocity across the entire U.S. economy. 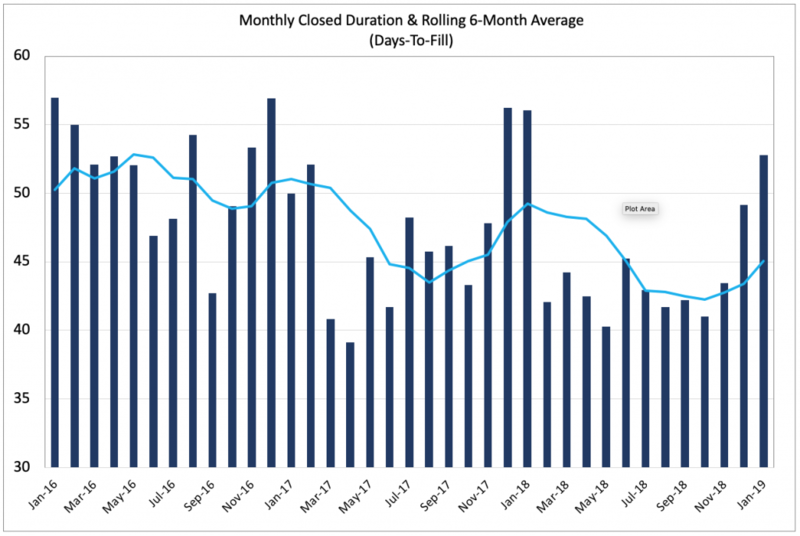 Again, seasonality and ‘The Purge Effect’ (where companies clear out jobs from their applicant tracking system with updated hiring priorities for the year) had an impact on December and January Duration measures, but without question, Job Duration is rising and hiring velocity is slowing down. So the central question on everyone’s mind, and the main line of questioning yesterday for the Fed Chair, is whether or not the U.S. is heading into a recession. While we’ll have more to add to the conversation tomorrow with our complete data for January at a macro and sector level, we thought it might be instructive to look at a handful of selected companies within specific sectors to get a sense of whether or not the economy is cooling off. Keep in mind that distilling macro trends from seasonality is a challenge (to say the least), but some clear trends are most definitely apparent in the data. 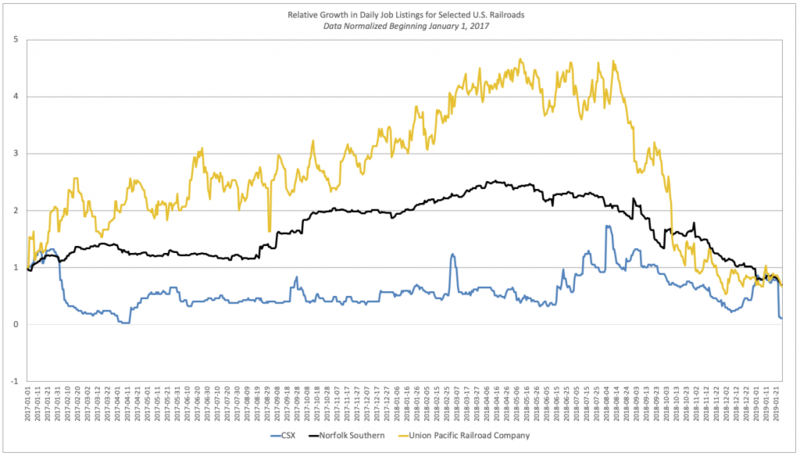 CEO optimism aside, labor demand among the railroads is clearly declining. 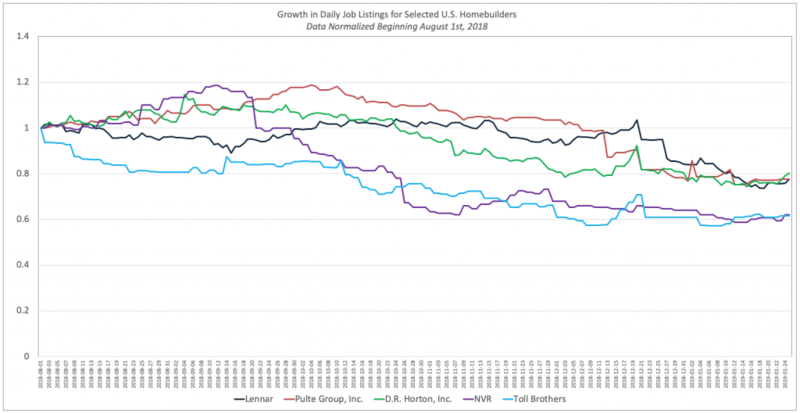 The same is true with homebuilders. And yet, on the other hand, semiconductors are showing no such drop. For certain, we’ll provide more extensive macro and sector data tomorrow when we get our January paired-month data as well as complete data for January. And unfortunately, with ‘Jobs Day’ falling on the first of the month, we don’t have the benefit of our January paired-month data for our NFP forecast (one of the inputs into our current model). This won’t be an issue going forward once we complete the improvements we’re making to our forecasting methodology, but for now, we’re forced to make our forecast without it. 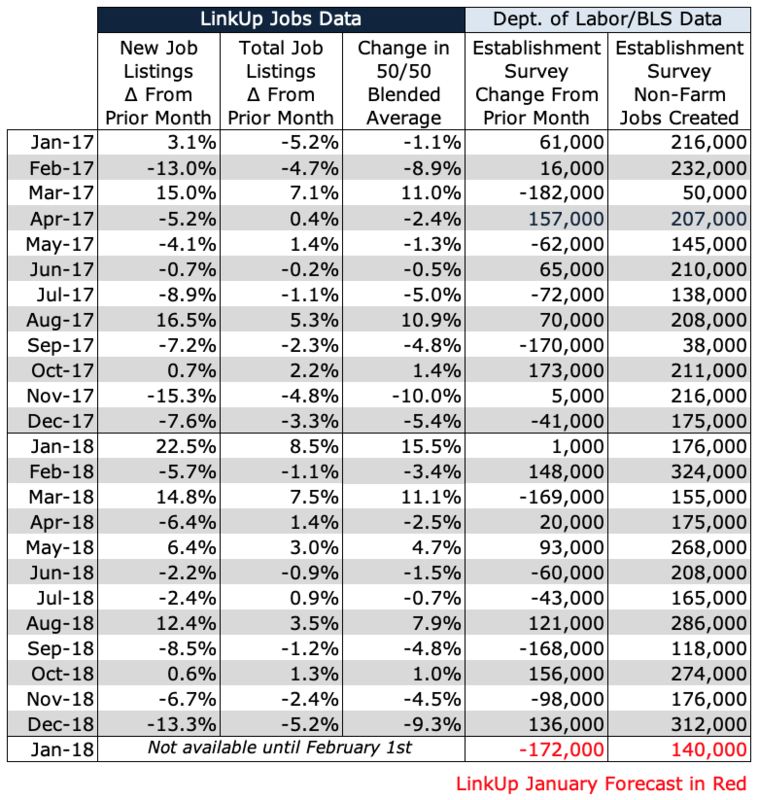 So for what’s it’s worth, we’re forecasting a net gain of just 140,000 jobs for January, somewhat below consensus estimates.